Our revolutionary Mastering The Time Prism Windows ScreenSaver Training System containing over 10,000 10 second training sequences. Put this tireless Mentor on your Monitor! Want to sharpen your success skills automatically? Want the best ideas from the best brains in the world to quickly improve your success potential? To help you through the most troubling times we have ever faced, we will put our Time Prism "Mentor on Your Monitor" for just $19.95 + S&H! The next 90 days are key to this year's success. To help you make THIS year the BEST year of your life, we are offering our Time Prism Intelligent Screen Saver Training System — which includes over 10,000 training sequences — at a "get one for everyone you know low price!" You will also receive our Secrets of the Time Prism and Achieve Success On Purpose CDs — a $60 value — included in this sensational $19.95 offer. Windows software that COACHES you to achieve your PERSONAL BEST — On Demand! And it does it each and every day — quickly, easily and painlessly! If you are serious about personal growth, you have just found a powerful partner. Without doubt, Mastering The Time Prism is the single best value in personal and professional training you will ever find. Guaranteed! Mastering The Time Prism software is an important component to the Full Power of TQ System. This may well be the most IMPORTANT software for Windows you can own — unlike anything you've ever seen or used. It takes less than 5 minutes to install, set up and get going — so you start learning — instantly. Just by watching your monitor, you'll develop powerful new skills to achieve personal excellence — each and every day! Simply click on an area of your performance that needs improvement from the control panel, and our digital coach displays a continuous stream of productivity-enhancing ideas, tips and advice. 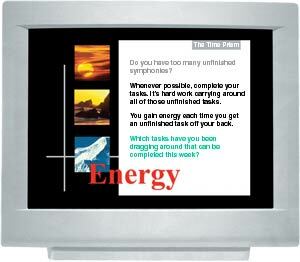 Mastering The Time Prism is an elegant Screen Saver Training System living inside Windows. It serves as a tireless reminder — continuously displaying over 10,000 10-second training sequences — each designed to maximize your personal effectiveness. It's like having a persistent, yet patient mentor on your monitor, coaching you to greatness — all day long — 365 days a year. You control how many ideas are presented, reading speed and screen appearance. You can do searches on topics like stress, delegation, conflict or procrastination. Enter your dreams and goals so you'll be continuously reminded WHY you're working. You won't even need to remember to remember! This idea is SIMPLE — but unbelievably POWERFUL. The Time Prism turns your PC into a powerful, yet patient, personal trainer. It gives you a continuous flow of great ideas for action you can immediately put into action. It's this spontaneous coaching that helps you turn up your performance — making you instantly more productive in the moment — and all day thereafter! You can't afford to wait to learn new skills. You have to develop them while you're working — in the heat of the battle, and in the pause in the action. See Smart Idea — Do Smart Idea! The key is our simple-to-use Windows software that gives you a series of "training breaks" throughout your frantic, and sometimes less than fulfilling day! When your PC goes to "sleep", your Screen Saver kicks into action. When it does, The Time Prism gives you a 10-second training break — displaying a great performance-enhancing idea for action, that you can put into immediate action. To perform better, you simply take the action recommended. Never has performance training been this quick and easy! ENERGY: Learn how to Commit to Peak Personal Power! MISSION: Learn how to Live What's Most Important! ATTITUDE: Learn how to Transform your Passion Into Action! SET GOALS: Learn how to Turn Your Dreams Into crystal-clear GOALS! MAKE PLANS: Learn how to Turn Your Goals into Rock-solid Plans! PRIORITIZE: Learn how to Always Remain Focused on Your Priority #1 First! SYNERGIZE: Learn how to Create Powerful Leverage and Interpersonal Synergy! ORGANIZE: Learn how to Get and Stay Organized! OPTIMIZE: Learn how to Make Every Minute Count! ACT NOW: Learn how to Make Positive Things Happen! To learn more about the importance of each Color to your performance, please review the Personal Workshops listed in the TQ Products Menu at the top of this page, or learn more about the Full Power of TQ System. Improve your skills by watching personal "infomercials"! These highly distilled ideas are like 10-second "infomercials" for your success. Doing them simply means "buying in" to what they're "selling." And what they're selling is a big-time break in your routine, for a big-time gain in your performance! The Time Prism is there for you all day long, silently persuading you to continuously tune in to your performance and work smarter, compete smarter and live a little smarter! Practice doesn't make perfect. Perfect practice makes perfect. We make it push-button simple! The Time Prism goes way beyond any software you've ever seen. Drop-dead gorgeous, fun and exciting to use, it keeps thousands of Smart Ideas in front of you — giving you a powerful edge in everything you do. Thousands of Smart Ideas you can put to immediate use — everyday — all day long! Works like a ScreenSaver but you have total control over topics, reading speed and screen appearance! Fun, friendly and completely painless — Installs in less than 5 minutes! Every idea is color-coded for instant access, making it easy to get at the right idea to help you — Right Now! It's like having a personal trainer dispensing on-point advice to correct your actions — right when you need it most! This is the fastest and easiest way to learn, remember and master superior time management and personal performance skills. Guaranteed! The best of the best extracted, condensed and distilled. You've probably read some of the same books we used as the initial "idea source" for The Time Prism: The 7 Habits, Unlimited Power, One Minute Manager, Managing For Results and 150 others written by experts such as Stephen Covey, Tom Peters and Zig Ziglar, to name just a few. No question, these authors all have a fantastic number of life-changing ideas, tips, techniques and great advice for improving results and achieving success. But here's the problem. They are all locked inside of books up on the shelf — out-of-sight, out-of-mind. To cure this out-of-sight is out-of-mind problem, our staff researched over 100,000 pages of timeless gems of wisdom, from 150 different authors. We then color-coded thousands of individual ideas for action — and completely rewrote them — in concise, on-point, simple-to-understand language... with all the fluff, duplication and philosophies eliminated. So, what you get is the pure heart of the matter — some 1,300 Key Ideas for personal improvement, drafted into 10,000 unique training sequences — each color-coded to the 10 Colors, and 100 key Factor actions that drive your performance. Thus, we are able to take all this fabulous advice off the shelf, and put it into your life — where you can actually SEE it... REMEMBER it... indeed, USE it — to instantly become a great deal more efficient, productive and effective! Mastering The Time Prism Software is an important component to the Full Power of TQ System. It is delivered on CD 1 of 12, which also includes our highly motivational, educational and inspirational 1-hour audio program: Secrets of The Time Prism and 10 Colors of Intentional Excellence. On this single CD, you will learn the importance of keeping each of your 10 Colors burning brightly — at all times. You will discover WHY the intensity of your 10 Colors either moves you towards the success you want — or holds you back from it. Improve these 10 Colors, and you will succeed beyond your wildest expectations. Permit them to drop, and you will suffer the heart-break of failed expectations for the rest of your life. Perhaps even more important to your long-term success, you will learn WHY it is critical that you remain committed to your DREAMS and connected to your PERFORMANCE. Simply pop this CD into your player, and you will gain an understanding of the forces moving you towards success — or holding you back from it. If you are looking to quickly gain a powerful personal edge, this is what you have been looking for. Guaranteed! Note: This item is also included in the complete Power of TQ System. Take advantage of our special promotional pricing. Order this item today for only $19.95! Note: This item is included in the full TQ System.